The St. Kitts & Nevis Patriots begin their 2016 CPLT20 campaign on Thursday (June 30). 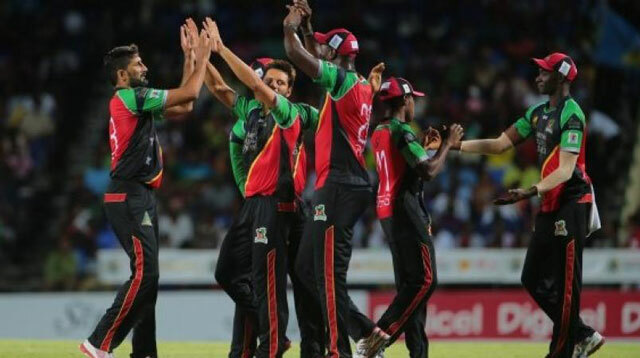 Basseterre, St. Kitts, June 29, 2016 (SKNIS): The investment by the Government of St. Kitts and Nevis in the Caribbean Premier League Twenty20 (CPLT20) – dubbed the biggest party in sports – has redound to the benefit of the ordinary man and woman and makes it an attractive option for long-term partnership, declared the country’s Deputy Prime Minister and Minister of Sports, Honourable Shawn Richards. At a press conference late Monday (June 27), Honourable Richards said that in addition to hosting four regular games from June 30 to July 05 in the 2016 Twenty20 Tournament, the Warner Park Cricket Stadium will play host to the climaxing rounds in early August. That bid of US$1.2 million or approximately EC$3.26 million was successful in securing the hosting rights. However, some of that cost will be recovered in various ways. He also made reference to the charity game which has traditionally being held as part of the CPL experience. The monies raised are donated to a worthy cause as was the case in 2015 when US10,000 went towards scholarships under the St. Kitts-Nevis National Education Foundation (SKNNEF). “Despite the fact that we don’t have a charity game this year … we still would be very much interested in seeing a donation being made to the St. Kitts-Nevis National Education Foundation. Ultimately, we have discussed a US$25,000 donation towards the foundation,” said Honourable Richards, who is also the Minister of Education. Speaking to the direct benefits of the cricket competition, the deputy prime minister said the local CPL franchise, the St. Kitts & Nevis Patriots, has been investing in the upgrade of Warner Park as well as engaging in social community projects. Mention was also made of the spending by players, coaches, officials and visitors in accessing goods and services while in St. Kitts and Nevis, which includes accommodation and transportation. An increase in economic activity surrounding the games by local vendors, businesses and entrepreneurs was also highlighted. Minister Richards said the indirect benefits are hard to quantify but quoted statistics by CPL officials that indicated that 93 million persons viewed the tournament last year. The viewers would have seen various promotional spots that were aired of each host territory during game broadcasts. Such exposure is likely to continue up until 2019 as the Federation has a contractual commitment with CPL up until that time. During this period, Deputy PM Richards assured that opportunities to capitalize on this arrangement will continue to expand to positively impact the population.